Following closely on the heels of those Juniors who have already successfully moved on from Youth Squad to RWYC racing is Nathan Kay. Nathan has now taken part in two races in his RS Tera Pro and has done well in both. Alex Nield, Anna Clough and Zach Shirra have had an excellent season so far, joining our well established Juniors, Robert Richardson, Steven Wilson, Jamie Wilson and Ethan Leahy in the highly competitive world of RWYC Handicap Racing. Nathan has already learnt that coming last on the water does not mean coming last in the results; proving this point in his first race by beating his Dad. 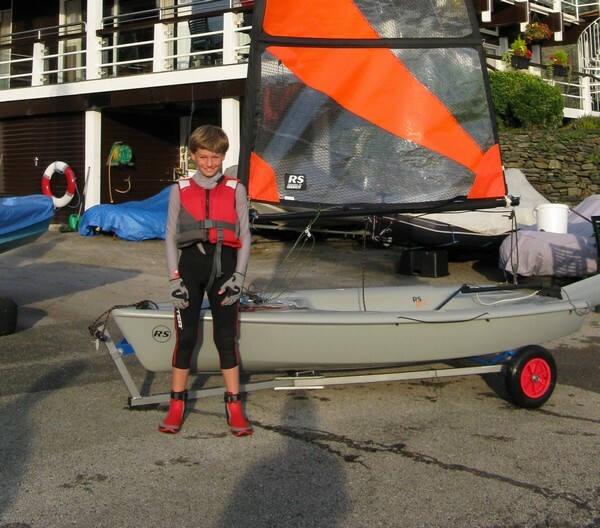 Next year no doubt Nathan will be taking part in the Junior Races, (those sailed in different Classes of boat), which this year were won overall by Steven Wilson. Unfortunately the 17ft Junior Race was called off, on the water, due to high winds. However the Commordore’s Tea Party and Prize Giving went ahead, at the end of which, Steven graciously thanked all the boat owners, Race Officers and assistants (as well as the Tea providers) for ensuring the race series went ahead. At the time Ethan Leahy and Robert Richardson were away taking part in the 29er Nationals at Torquay, and doing extremely well. RWYC Youth Squad is proving to be a wonderful addition to the Club’s activities and is key in ensuring a Junior continuity at the Club. The addition of the three Club RS Fevas is already proving useful, and we would hope to see Juniors out joining in the racing in two-hander boats in the future. So a special big thank-you to all those who got the Youth Squad off the ground in the first place, and to those that continue to support the Squad, run the Squad and provide the excellent training.